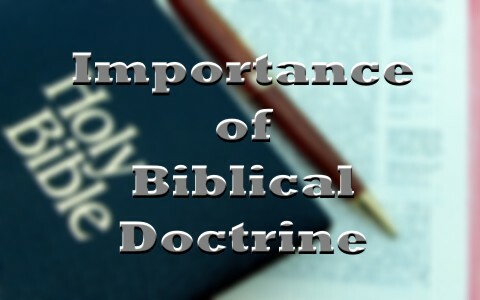 What Is The Importance of Biblical Doctrine? One of the most exciting times as a pastor was when I completed my initial seminary studies and ordination as I prayerfully considered callings from different churches. However, I was dumbfounded by some of the comments made by those tasked with selecting candidates. One committee of a very famous church said, “We hope you are not one of those pastors who always preaches the gospel as part of each message.” Another said, “We don’t want messages with boring doctrine, we want messages with lots of interesting stories.” Needless to say, I respectfully declined to proceed in those cases, but it brought to mind that these churches wanted their ears tickled and/or they needed to learn what is the importance of sound Biblical doctrine. What is the common definition of doctrine? The common definition of doctrine is (1): (Noun) “doctrine; plural noun: doctrines. A belief or set of beliefs held and taught by a church, political party, or other group.” “Origin: late Middle English: from Old French, from Latin doctrina ‘teaching, learning,’ from doctor ‘teacher,’ from docere ‘teach.’” From this common definition, we see that foundational beliefs are taught for the benefit of learning. What is the Biblical definition of doctrine? It is very clear from the Biblical definition that doctrine involves teaching and learning something. The question then becomes, what is taught or learned? In the context of eternity, the answer to this question is critical and can have eternal consequences. Why is Biblical doctrine important? The simple answer is “All scripture is given by inspiration of God, and is profitable for doctrine…” This statement tells us that all Scripture is inspired, which means “God breathed” or “divinely breathed in.” The word inspire is commonly used in medicine to mean inhaling just as expire means exhaling. To the writers of the Scriptures, God breathed into them by the Holy Spirit, who “moved” them to write or “bring forth” what He wanted them to write (2 Peter 1:20-21). What is taught then? What is taught is that all Scripture, the written Word, was given by God to the writers through inspiration and what they wrote is profitable for teaching and learning. The simple answer is reproof, correction, and instruction in righteousness. Reproof means that the Scriptures teach us where we differ from what God wants us to be. Correction means that the Scriptures teach us what we need to change to be what God wants us to be. Instruction in righteousness means that the Scriptures teach us how to be what God wants us to be. These three things are the foundational goals of all teaching and learning. The teacher communicates what is to be taught in a way that considers the background, learning ability, education, social experience, needs, and method of teaching that best enables the student to learn (1 Corinthians 9:16-23). In this case, the teaching uses this approach to teach reproof, correction, and instruction in righteousness so that the student can be what God wants them to be (John 7:14-18). The simple answer is “that the man of God may be perfect, throughly furnished unto all good works.” This is the desired end. God wants the teaching and learning to result in perfect righteousness through salvation by grace through faith (Romans 10:17). In addition to this, God wants the born again believer to be “throughly” furnished to produce good works. The use of the word throughly in the original King James is slightly different from thoroughly as found in other versions. Throughly paints a picture of being furnished both inside and outside to produce good works by the power of the Holy Spirit living inside the believer. We can be “thoroughly” furnished to do anything, but are we motivated from inside “through” the inspiration of the Holy Spirit to love God and love our neighbor? This internal motivation inspires us to produce good works from our hearts. Without correct doctrine, everything is adversely affected. We have a false view about the source of the Scriptures. We have a false view of what God wants us to be. We have a false view of where we differ from what God wants us to be. We have a false view of what needs changed in our lives. We have a false view of how to change and we have a false view of God’s idea of perfection (Matthew 15:8-9). In Biblical counseling, bad counsel or false doctrine is constantly exposed as the foundation of wrong feelings and motivations, which lead to wrong behaviors and outcomes (John 7:18-24). Simply stated, bad doctrine produces bad counsel and bad counsel produces bad outcomes. Doctrine is the foundation of teaching and learning. Biblically, true doctrine provides the student the opportunity to learn what is taught, what should be learned, and what is the desired result that God wants us to know from His Scriptures. False doctrine prevents this from happening. Both produce differing feelings and motivations, which lead to differing behaviors and outcomes that have differing eternal consequences. Take a look at this related article: How Can We Recognize False Doctrine? Resources – Scripture quotations are from The Holy Bible, King James Version. Williams, Michael, (2013). Introduction to Biblical Counseling. Albuquerque, NM: Selah Mountain Bible Institute. (1) Google. (2014). “Doctrine”. Retrieved from Google, https://www.google.com/?gws_rd=ssl#q=doctrine. (2) Strong, James, (2014). “Doctrine”. Strong’s number H3948. Strong’s Talking Greek & Hebrew Dictionary. (3) Strong, James, (2014). “Doctrine”. Strong’s number G1322. Strong’s Talking Greek & Hebrew Dictionary.